Home » Posts Tagged "MacGregor 25"
We had a busy weekend… a trip to the ER, a visit with parents, the cat brought a rabbit downstairs, and we still found time to go sailing! Michele was having some bad symptoms from her recent concussion, but everything is on the mend. 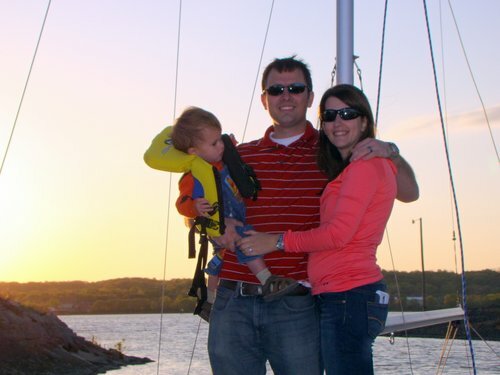 Family sailing - Carter didn't enjoy it as much... he's tired. Michele, Kyle, Carter, and I had a great sail yesterday. The wind was a little too light, but hey… we’re learning! We were able to get both sails up for the first time, what a difference. 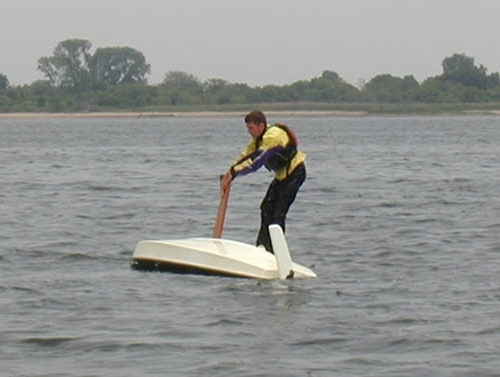 The boat is significantly more controllable with the jib, properly trimmed (how do we know it was properly trimmed? We took NauticEd’s free sail trim class! ), assisting the main. Thanks to our new friend the jib (more weathered sailors need to keep the laughs at a minimum… you’ll wake the baby) we were able to sail a respectable 3.6 miles. Beginning at our new home port Detweiller Marina we turned South West and had the wind perpendicular to our course. The new marina helped immensely by reducing the time we spent between the marina and the channel. 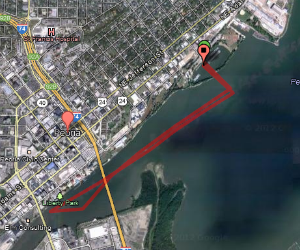 Detweiller is around 200 feet from the channel… Spindler is over a quarter mile. We had a beautiful sail past the downtown skyline. Let me make a quick digression… there is a no wake zone between the two large bridges flanking each side of downtown where cabin cruisers (and wannabe cabin cruisers) like to raft up. To each his own, but it seems like a gigantic waste to buy a beautiful, expensive boat and never actually go anywhere in it. If you can’t afford the gas in your boat get a different boat… preferably one with sails. Upon our final turn into the marina, we were greeted by a cluster of drunkards sitting smack dab in the middle of the marina. I am under trolling motor power at this point, not winning any races here. One group of drunken people saw us coming in and decided it would be a good idea to power over, cross our bow, and park immediately in our line of travel about 50 feet away. After (as nicely as I could given the situation) asking them to move their drunken selves out of the way of traffic we were able to tie off at the launch ramp. Truly a wonderful sail! 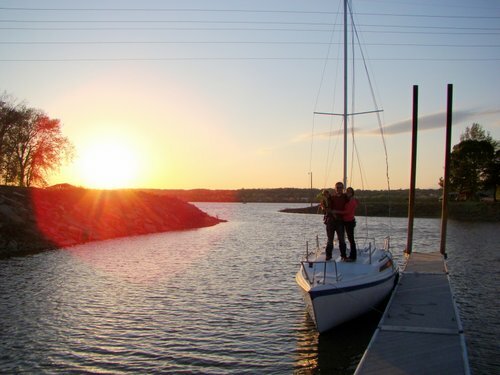 Michele and I begin our official sailing lessons tonight… we are used to just winging things, but our first few adventures told us to seek professional help. 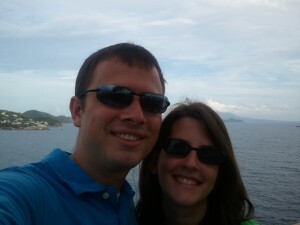 So, for those of you who are keeping count, Dan and I have been sailing this year a grand total of… three times. Well, actually he’s been three, and I’ve been sailing twice and trying frantically to find somewhere to land the boat once. Seeing as it is almost the end of May you might be wondering where all of our sailing stories are. There are a couple of reasons (see: excuses) why we haven’t seen as much wind this spring as we had originally anticipated, but hope to improve over the summer. First, the weather has been crazy. All week it will be beautiful sailing weather, then its freezing and rainy all weekend. Also complicating our plans is that our boat is not currently in a slip. This might not sound like a big complication, but it takes significantly longer prep time to have to pick up the boat and step the mast before heading out on the water. It pretty much limits our sailing time to weekends except for in the middle of the summer when there is a lot more daylight time to work with. Finally, Dan’s brother Kyle has been working most weekends, and due to my status as resident weakling, we need help stepping the mast. Now that I’ve got all of the logical reasons out of the way, here’s the embarrassing one: we’re a little afraid of another disaster. Our confidence has been somewhat injured by our failures so far. (Though one of our 3 days was actually perfect.) Kyle, Becca, Dan and I actually had the boat down at a marina on Sunday, but we chickened out after watching another boat glide peacefully out of the harbor, only to get practically laid down as soon as they hit the 20 mph winds on the river. We just aren’t ready for dealing with that yet. No worries, though! We haven’t given up, we are just going to get a little confidence boost before doing anything else crazy. 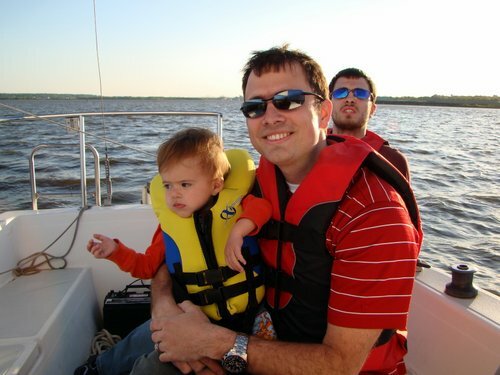 Dan and I are taking a sailing class starting in June that should get us right back to our good-old-selves. Nothing like a little hands-on where the most experienced sailor in the boat isn’t the one who took the free online class! In the meantime, we’re going on a sweet dive vacation to Bull Shoals, Arkansas…full details forthcoming. After our second time sailing on the MacGregor, Michele and I decided to invite my youngest brother Alex, his girlfriend Stephanie, and my parents along for the ride. It was a bad idea. I guess after our second voyage I was pretty confident and felt that while I had not mastered sailing (if one can even “master” sailing) but I had at least established a foundation upon which to build. The wind was a steady 10-15 knots and gusting above 20… again a bad idea for trip number three. We had learned from our previous experiences when the river drops enough to lower the keel, when it was best to raise the main, etc. All in around 5-10 knots of wind. Not 10-15. We raised the main too early. 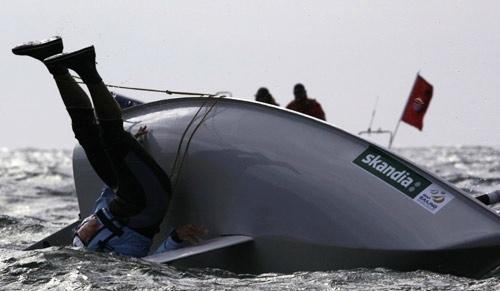 By “too early” I mean we weren’t yet in the channel and we couldn’t yet fully lower the keel… again a bad idea. This left us with two choices #1 sail with the keel not lowered far enough or sail with the keel dragging. We decided on not lowered far enough. This allowed us to at least move the boat into the channel at which point we would be able to lower the keel and point to wind. However, perhaps a little to leery of repeating my first sailing adventure, I did not want to go with the wind past the marina as we did in the first voyage. Again, a bad idea. Forcing the boat into the wind with the keel not in the correct position caused the high (for me) wind to push the boat down wind even though we were pointed around 60 degrees off wind. So at this point I have my parents, younger brother and girlfriend, wife, and baby on a boat that is pointed one way yet going another. Enough is enough, I am not too prideful to admit that I am not yet experienced enough to attempt the current circumstances. I decided to cut my losses and return to the marina. We lower the mainsail and begin (electric) motoring back to the marina. At this point the wind begins blowing at a steady 20 knots. At least I made the decision prior to the wind picking up, right? Now all I have to deal with is a light boat that drafts 11 inches bobbing in 3 feet of water (can’t lower the keel) that is broadside to 20 knots of wind. With a trolling motor. Needless to say direction the bow was pointed had much less to do with the direction of travel than the force of the wind on the side of the boat. Even though we were motoring significantly windward of the marina entrance we ended up 500 or so feet down wind of the entrance. The little motor, while perfect once we are in the marina, was not capable of making headway against the wind. Dismayed, I turned the boat down wind and stopped at the free city boat launches about a quarter mile down river from our marina. The free boat launch lacks most things you would think are necessary at a boat launch… like a dock to stop at so you can disembark and retrieve the trailer. It fell to myself to jump in the water and walk the boat to a safe spot while I walked back to the marina. While I was moving the boat to a safe spot I kicked an underwater rock and broke a toe on my left foot. So let me recap my situation at this point for you, just in case you have lost track of the dismal events… I am standing in three feet of cold, murky water with only a coat, life preserver, and boxer shorts on pulling a boat that is being pushed by the wind, and just broke my toe with my family watching on. Extremely embarrassing. And now I am sharing this story with you… also embarrassing. I do not share this simply to embarrass myself. I share this story because it truly reminded me how different the cruising life will be from what I am used to. A more experienced sailor would have had no problems whatsoever in 10-15 knots of wind. Matter of fact we saw three other similarly sized boats sailing around. At the low point of the voyage (standing in the muck in my boxers) I couldn’t help but have a moment of introspection… What the hell was I doing? No one but Michele and I are going to make our dream of cruising become a reality for us. I am acutely aware that there will be times when things won’t work out the way we expect, people will (and already do) think we are crazy, but we are following our dream. 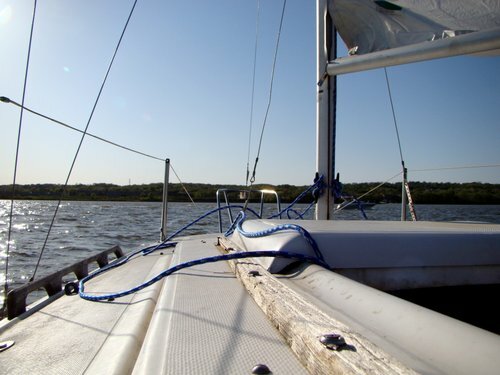 The purpose of buying a sailboat now was to learn to sail… and that’s what we’re doing. It’s not always going to be easy. So our most recent learning to sail expedition started out exceptionally poorly. We had just lowered our boat into the water and tied her off. Kyle was parking the Jeep while I was loading the boat with our toolbox (you never know) and other doomsday supplies and Carter was chilling on the bench beside Michele. The winch handle was chilling beside Carter. Carter has recently learned how to throw things, hes actually a pretty good shot for a 16 month old. 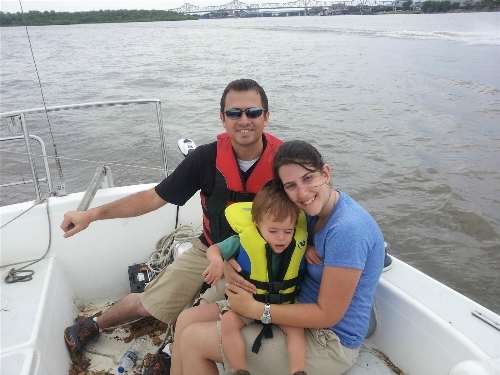 While Michele turns to me and in the split second she isn’t directly looking at Carter (before you blow up and call child services, we all had life jackets on and Michele had a hand on Carter), he decides it would be a good idea to chuck the winch handle into the river. Now the winch handle is chilling (literally, the water is around 55°F) under 7 feet of Chicago sewer run off (Illinois River). After much debate and consternation, it is voted that I shall be the one to retrieve the handle. Oh joy. A change into swim wear, 15 minutes of hypothermia inducing water, and the winch handle is retrieved. Not a good beginning for our second voyage. If we want to sail around the world, we have to start somewhere. 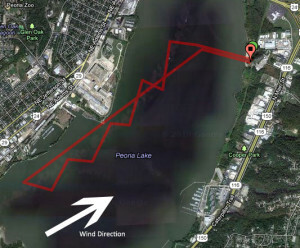 Some of you have hopefully read my too-funny-to-be-true story about my first venture into the world of sailing the high seas (or the Illinois River)… Everything that went wrong last time went right this time. Not exaggerating. Learning to sail the easy way indeed. Our second voyage, 5 miles. Click to enlarge. We were a little nervous about our new motor, it being a trolling motor and all. That little champ had no problems moving our 25 footer around the harbor and out into the open ocean (river). Once we cleared the mouth of the harbor we were able to successfully point our bow to wind. No windex though, that was a casualty of the last excursion. Bow pointed to wind, it was almost trivial to hoist the main, lower the keel, and sail up wind. Yes, I sailed up wind. In a boat. I was beginning to write off as sailor’s salty stories the tails of beating to wind for hours. Last time, I couldn’t point within 30 degrees of the wind. But it happened this time. The wind was around 10 knots according to the weather man, but it was more like 3 knots gusting to 14 knots. This made it quite difficult to tack for us newbies when the wind was at 3 knots. We ended up cheating (only a little, mind you) and using the motor to help swing our bow through the wind. During the gusts it was another story. Being a sailor of but two voyages, I didn’t expect the boat to make any noises (and maybe it isn’t supposed to). When we were pointed approximately 40-45 degrees off wind the boat would begin to hum. 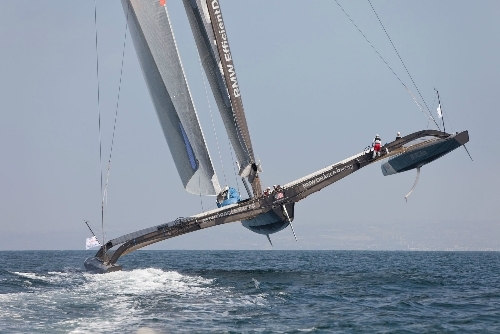 At first we thought we had hit ground, but we were moving far too fast to be dragging our keel. Then we noticed that the boat only made the sound when we were pointed windward as much as possible. I still don’t know if that is supposed to happen or if I narrowly escaped my boat exploding. For the return leg of the journey Kyle took the tiller and we sailed at a run back to home port. What took us an hour and a half into wind took around 20-30 minutes returning. We were able to lower the main and motor into the harbor like we knew what we were doing, which we didn’t. All in all it was a more successful voyage than I could have hoped for, especially after the previous debacle/attempt at wind powered locomotion. We are following our dreams. It may be baby steps at a time, but it is comforting and exhilarating knowing that we are moving in the right direction.